We’ve therefore created this informative post which will answer your questions. We’ll discuss what is a wine cooler. Which benefits a wine cooler can offer. What type of wine coolers there are. And last, but not least, what are the best wine cooler currently on the market. However, these days, wine coolers can come with a plethora of extra features. From special dual-zone cooling storage to solid glass doors to keep out sunlight and prevent oxidation. And then there are tabletop coolers, wine fridges, wine preservation chillers. So, let’s explore what exactly the options are, and how you can determine if a wine cooler is worth the splurge. A wine cooler keeps your wines stored in optimum conditions, preserving your wines’ quality and longevity. 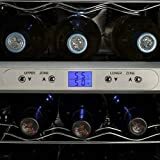 The temperature control feature is the most important function of a wine cooler and is the main reason to invest in one of these premium wine accessories. The temperature control function of each product can vary in effectiveness. Most wine coolers will allow you to adjust the temperature to a range that matches your wines best. Though some cheaper options may with pre-programmed, non-adjustable settings. We would always recommend you to choose a wine cooler that does include a wide range of storage temperature options, as its more versatile, and worth the splurge. Some designs also come with additional temperature control settings. 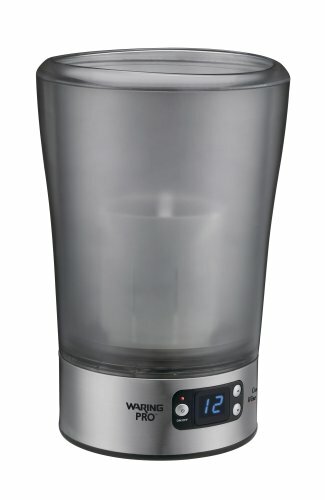 The Waring Pro Wine Chiller, for example, uses a special control sensor technology to detect fluctuations in temperature and automatically corrects its cooling to keep maximum temperature control. Most wine coolers on the market will either have a single, or dual-zone cooling compartment. The first speaks for itself: the fridge is not divided into separate areas, and therefore only cools at one temperature. 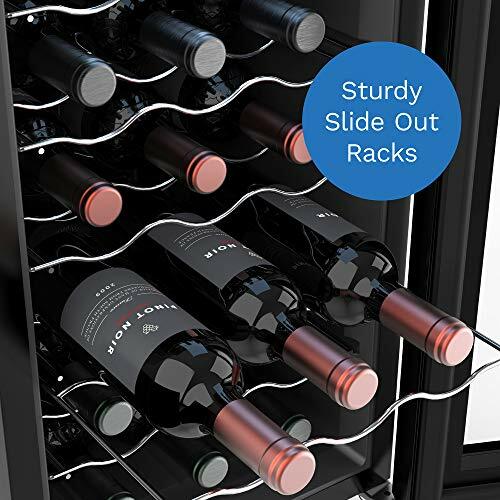 A dual-zone wine cooler has two, separate compartments that can be programmed independently. This means that, for example, one zone can chill whites at 46° Fahrenheit, whilst the other keeps your reds stored at 60° Fahrenheit. 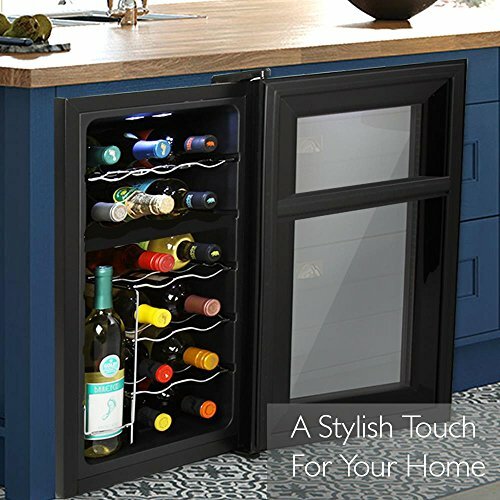 A dual-zone wine cooler might be a bit more expensive than a single-zone design, but it does offer a lot more functionality. If you only drink reds or whites, a single-zone will be sufficient. However, if you like to mix up your varieties, a dual-zone cooler may be better suited to your needs. The design of dual-zone fridges can vary. One might have a 50/50 divide in the size and capacity of the separate compartments, whilst another can have a 75/25 ratio. This means that there is a perfect match for every wine preference and wine enthusiast. Nearly all wine coolers come with a glass door feature. There are some exceptions, such as open, table-top coolers. That said, larger coolers will have a glass door design; as this is both functional and stylish. A glass door has multiple benefits. Firstly, it gives you an instant overview of your bottles stored. Secondly, and more importantly, a glass door reduces the risk of oxidation of wines. Look for wine coolers with a thermal pane door, with tinted glass. These block out sunlight and harmful UV-rays. By keeping your wines ‘in the dark’, the coolers are able to prevent oxidation of wine, which can be a consequence of UV or sun exposure. If you value ease of usage and are a bit of a technophobe, look for a wine cooler with intuitive controls. Most contemporary designs come with a simple, touch-screen control pad, and pre-programmed settings, that make finding the right temperature a breeze. From sleek, integrated LED-control pads, to basic one-touch buttons: there are many variations available, so we’re sure there is a design to match your preferences. There is a big difference in the capacity of wine coolers. This is another important feature to consider when you’re shopping around for a wine fridge or chiller. How much storage do you actually need? From one-bottle table-top coolers to high-end 60+ bottle designs: the sky is the limit. For most wine enthusiasts, a wine cooler with a 16 or 24-bottle capacity will be more than sufficient. But, if you want to really invest in a wine collection, or have regular dinner parties with lots of friends, you might want to consider upgrading to a larger model. Do keep in mind that the larger the wine cooler, the higher its energy consumption will do. Plus, you’ll need the space in your home to store it. Smaller capacity designs are often more streamlined, slotting easily underneath kitchen counter or in cramped corners. If space is scarce, you might want to consider a single-bottle chiller without temperature control or fancy features, as listed in our 10 Best Single Bottle Wine Chillers list. 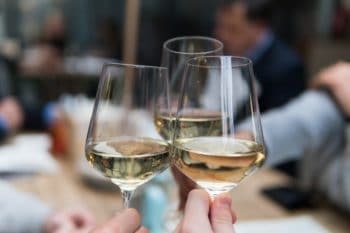 What is the best wine serving temperature? Though a wine cooler will keep your wines chilled at optimum storage temperature, there is a difference with ideal serving temperature. The perfect temperature to store wines is around 60° Fahrenheit for reds, and 46° Fahrenheit for whites and rosés. But what is the best serving temperature for these varieties? Red wines are generally best served between 62°-68° Fahrenheit. You probably will have heard reds are ideally enjoyed at room temperature. However, room temperature is approximately 70° Fahrenheit, so this is not entirely true. When using a wine cooler to store your bottles, you should take the bottle out of the fridge, and let it come up to temperature, before drinking. You can use a decanter, or simply let it warm to the touch. If you don’t want to use a wine thermometer to test if it’s ready to drink, just use the general room of thumb that reds should still feel slightly cool in the glass. White wines are best enjoyed at a temperature between 49°-55° Fahrenheit, as this brings out most of the flavor. Some white wine varieties, such as Sauvignon Blanc and Pinot Grigio, can even be enjoyed at even lower temperatures around 44° Fahrenheit. This is because it makes them even more refreshing, as a low temperature helps to highlight their crispness and acidity. More complex whites, such as oaked blends, should be served a little warmer, but try not to exceed the 55° Fahrenheit limit. When you use a wine cooler to store your whites, the recommend chilling temperature of around 46° Fahrenheit means your bottles are pretty much ready to be poured straight out of the fridge. You might want to let some whites come up to temperature a little bit. But, as your touch will warm them as well, we’d say that you don’t need to let many minutes pass before your first sip. This is one of the big advantages of a quality wine cooler: instant enjoyment of Whites and Rosés, maximum preservation of all your unopened vino bottles. And, in between pours, simply return your white wine to the wine cooler to keep it at optimum serving temperature until the next round! Read more about the ideal serving temperature of your wines here. We’ve reviewed dozens of wine coolers in the past few years. 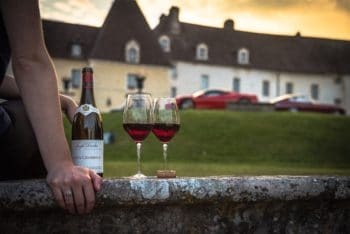 From budget buys to fancy, high-end models: we know exactly which chillers deliver on their promise to keep your wine cold, and preserved in style. 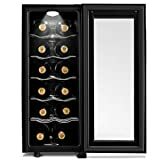 To help you on your way in finding the Best Wine Cooler for your personal needs, we’ve bundled some of our favorite picks in one, comprehensive overview. From table-top chillers to big capacity beasts: there’s something for every wine enthusiast. Browse our top picks for the Best Wine Cooler, sorted by capacity, below and get inspired to keep your chill! The contemporary design keeps your wine perfectly chilled, ready to be served. It is easy to use and features very user-friendly controls. Select your desired temperature via the digital, touch-screen control panel and let this device work its magic. 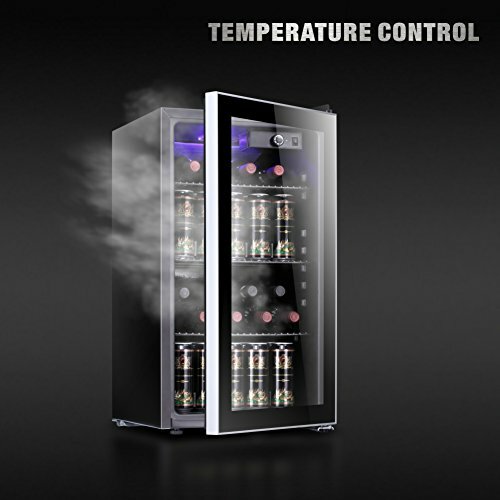 The Vinotemp 2-Bottle Open Wine Cooler has a range of 41-66° Fahrenheit. The coldest settings are perfect for whites, whilst the upper-temperature settings are ideal for reds. Though, we do recommend to double-check the ideal storage temperature of your labels prior to stocking the cooler – as each wine variety has different needs. This sleek wine cooler by Vinotemp features an open design, meaning there’s no lid – allowing for instant access to your bottles. The freestanding device does include special thermoelectric technology to chill your bottles evenly, and quickly. 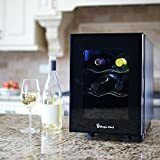 If you’re looking for a premium tabletop wine chiller with great functionality, sleek design, and a trusted name in wine accessories: this futuristic Vinotemp 2-Bottle Wine Cooler may be the one for you. The Waring Pro PC50 is the most basic model in the Waring collection. Important to note is that this design does not come with the pre-programmed wine temperature library. This means that you’ll be required to adjust the temperature yourself. An older item in the Waring Pro range, it is only available via third-party sellers and is no longer a staple in Waring’s assortment. That said: the Waring Pro PC50 is by far the most affordable model by the brand. Though it doesn’t have all the bells and whistles as the other Waring Pro devices, it chills as desired. This innovative take on an ice bucket has a recognizable, classic silhouette. The Waring Pro Wine Chiller PC50 is spacious enough for two regular bottles of wine. You also have the option to add ice to the ‘bucket’ if you want to chill the bottles even faster. What we also like is that this wine chiller can be used cordless. 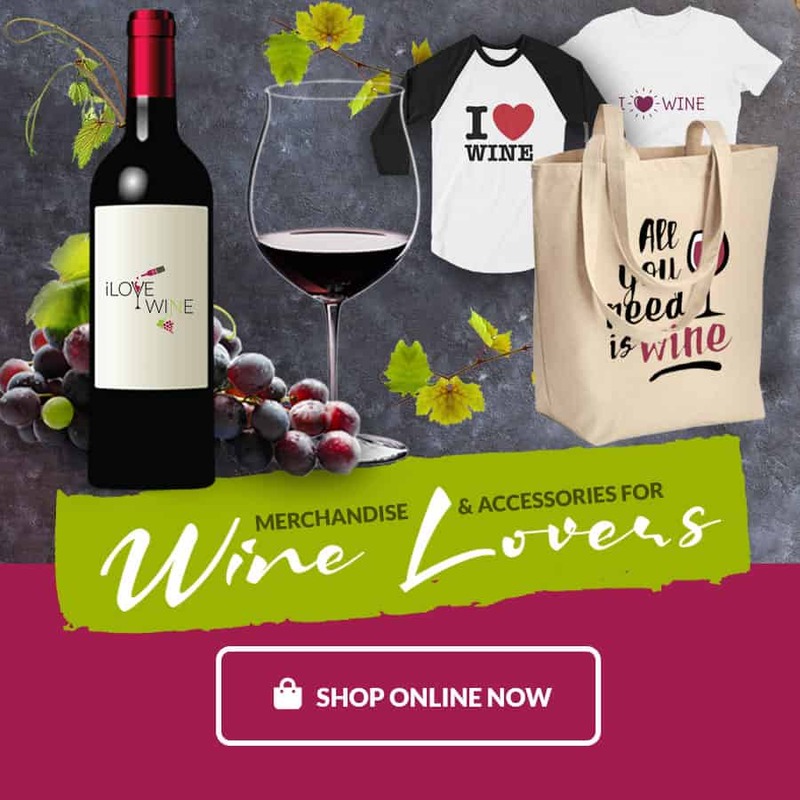 The product comes with a charger and battery pack included, allowing you to take it with you for chilled wine fun on the go. No more fiddling with bulky sockets or putting it near a power source: cordless convenience right at your disposal. 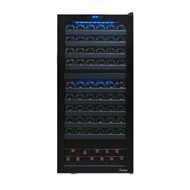 The Waring Pro PC50 Wine Chiller features an easy-to-use control pad with an LCD display. The display keeps track of the chiller’s temperature, whilst the intuitive buttons are ideal for quickly programming your preferred settings. This basic, budget buy might be the least innovative of the Waring collection – but it still allows you, and your bottles, to keep your cool in every situation. 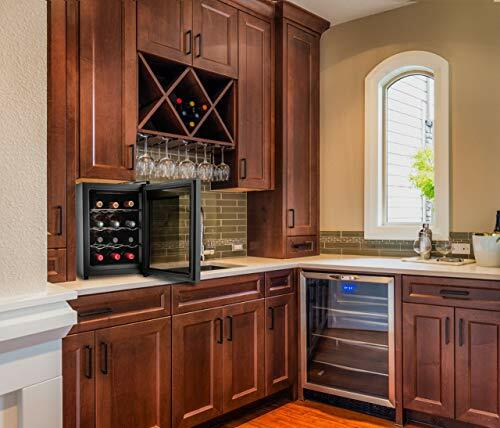 The wine cooler is quiet, compact, and fits perfectly on a kitchen countertop or wine cabinet. With a height just under 19 inches, it’s a great choice even for wine lovers with limited space availability. The EuroCave Wine Cooler features two separate compartments that operate independently. This allows you to alternate the temperature between each compartment, matching it exactly to a specific label’s needs. For example 60° Fahrenheit for reds, and 46° Fahrenheit for whites and rosés. 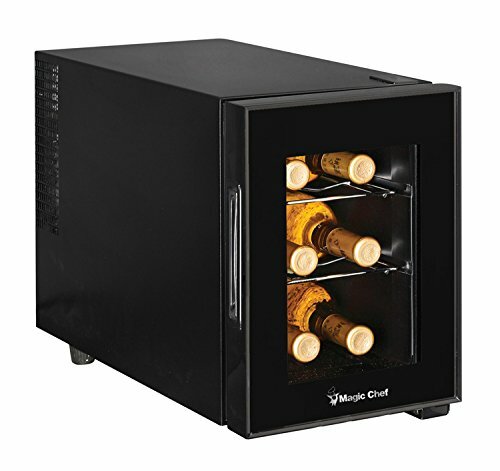 This small refrigerator from Magic Chef is one of the Best Wine Cooler Refrigerators for under $100. It has sculpted chrome shelves to hold six bottles of wine, plus interior lighting so you can easily see them without opening the door. As with many of the smaller refrigerators, it has single zone cooling and holds temperatures between 46ºF and 64ºF. Some users do note that the temperature control knob is quite small, but ideally, you only need to set this once. The entire unit is compact, meaning it fits neatly in smaller kitchens or pantries. We love that it has a small footprint and its affordable pricing. 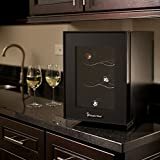 This small design is a perfect first wine cooler refrigerator for that friend who’s just discovered their passion for wine. 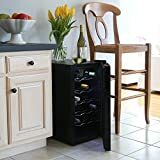 12 Bottle Storage Capacity -- With its 12 bottle storage capacity, this wine cooler is perfect for chilling and storing red,white wine or other wines (such as Beer and Champagne). Equipped with an accurate precision compressor technology cooling system, adjustable temperature control, integrated LED lights and built-in circulation fan and ventilation grill. The ZENY 12 Bottle Wine Cooler is a compact and affordable wine cooler. If you’re on a budget and/or have limited space in your home: this might be your perfect match. 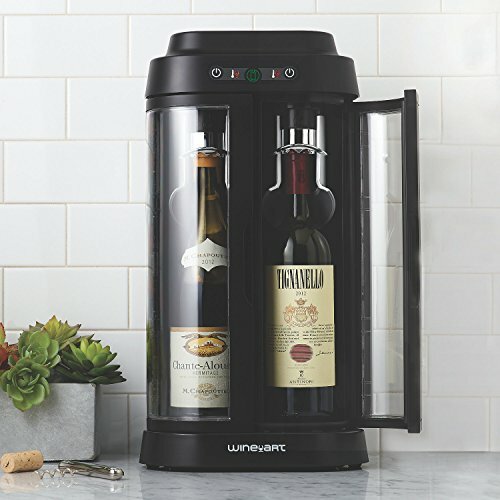 Though it comes at the lower end of the price range, it still offers all the functionality most wine drinkers will need. Yes, its storage space of 12 bottles might be a bit of a squeeze if you’re hosting a big party. However, for daily usage, it should definitely do the trick. The ZENY cooler has all the bells and whistles of other, more expensive brands on this Best Wine Cooler Refrigerators list. It has adjustable temperature control, integrated LED-lighting and intuitive controls. 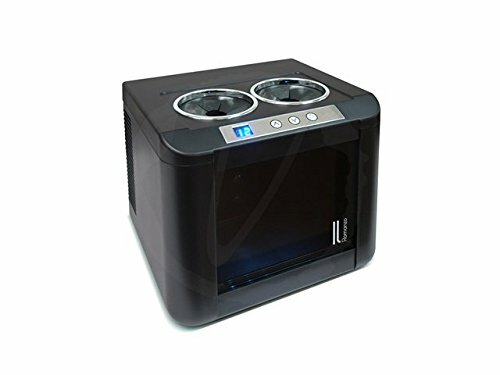 It also boasts a LED Temp display, and a built-in circulation fan to distribute the cooling evenly throughout the design. 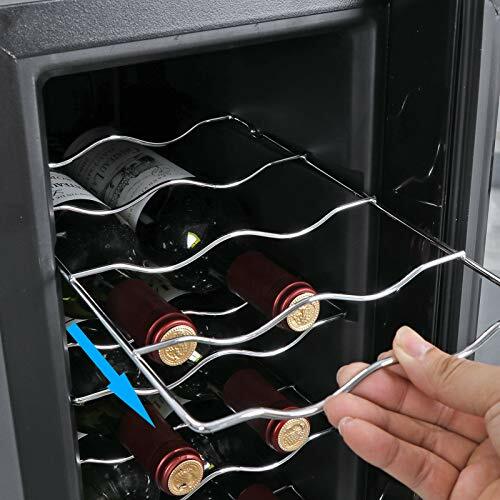 Set the temperature anywhere between 50° to 64° Fahrenheit, and keep your wines in optimal condition. This affordable Best Wine Cooler Refrigerators option has a slim silhouette that measures 9.9 x 19.7 x 25.0 inches. It includes 5 stainless steel shelves that slide out for instant access to your favorite labels. Designed as a stand-alone cooler, it is also compact enough to slide in tight spaces and corners. 【Numerous Beverage Storage】With a capacity of 12 bottles and a free-standing design, this refrigerator cabinet is ideal for use on the floor, table or under the counter. 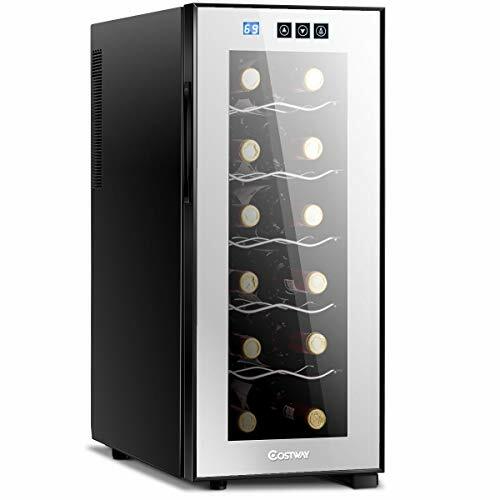 The Costway 12-Bottle Wine Cooler is a quality mid-budget priced fridge, rated highly for its spacious appeal and user-friendly features. The design holds up to 12 regular-sized wine bottles, perfect for the amateur wine enthusiasts. There are two things we particularly like about the Costway 12-Bottle Wine Cooler. Firstly, this fridge has a relatively small width. The makers have designed to built it upwards, instead of outwards: making it tall and slim, ideal for storing it in-between cupboards or anywhere with limited floor place. Secondly, the shelving is adjustable. This means that if you want to store a larger bottle, you can re-arrange the quality steel shelves to match your needs. Making it extra versatile for all kinds of liquors and labels. 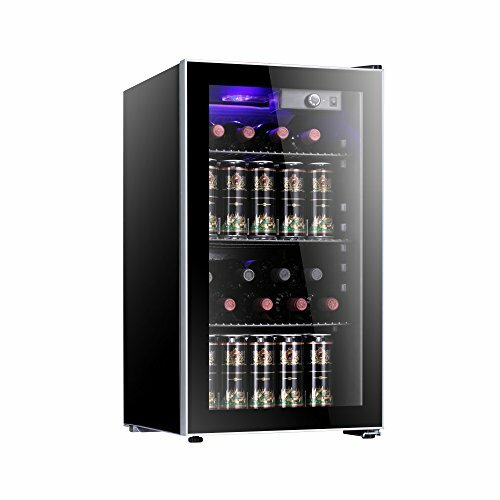 The Costway 12-Bottle Wine Cooler has a temperature range of 54º to 64º Fahrenheit. This quality choice also comes with a futuristic LED-display, LED-interior lighting that emits a stylish blue glow, plus an easy to use control panel. 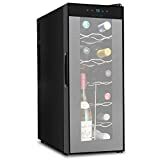 Affordable, spacious, highly-rated, and a convenient tall and slim silhouette: the Costway 12-Bottle Best Wine Cooler Refrigerators pick is a cool favorite amongst wine lovers, and makes a great addition to any home. The Belwares 12 Bottle Countertop Wine Cooler is a great alternative for larger, freestanding fridges. The countertop top cooler is ideal for cramped kitchens, offering maximum functionality with minimal space requirements. The design holds 12 regular sized (750ml) bottles and boasts various high-end functions. It allows you to set the internal temperature from 54ºF to 66ºF. Which can be adjusted via simple, intuitive controls. This petite cooler is also low in vibration and low in noise. Silent, yet efficient: the best of both worlds. The Belwares 12 Bottle Countertop Wine Cooler also has a sleek look and feel. And features a stylish, curved glass, front door. This thermal pane door keeps your wines ‘in the dark’. This means it blocks out sunlight and UV-rays. Which, therefore, prevents the oxidation of your bottles. 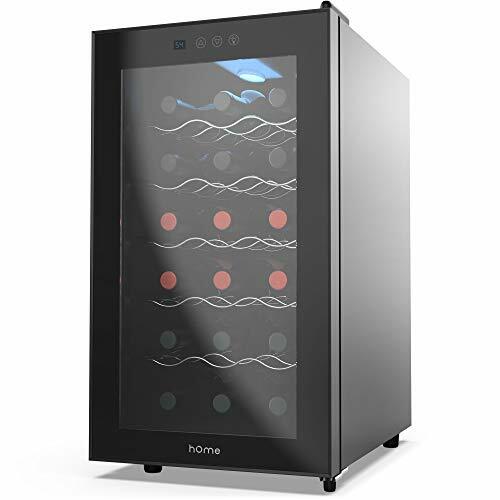 The hOmelabs 18 Bottle Wine Cooler is one of the internet’s best-selling wine fridges. It’s no surprise this model is so popular, as it offers a lot of bang for your buck. The design is praised by wine aficionados for its functionality, value and compact design. The free-standing cooler is designed to keep your wine at a perfect temperature. By storing your wines at a consistent, stable temperature, you can maintain their flavor longer. This cooler enables you to set the temperature anywhere between 54°F – 66°F; depending on which wine varieties you want to stock. 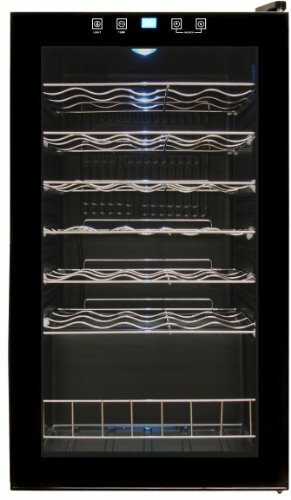 This sleek wine fridge measures at 14.0 x 20.1 x 25.5 inches and can stock up to 18 regular (750 ml) wine bottles. It has five racks, each made of polished chrome, for sturdy, durable storage. The cooler’s control panel also features a futuristic LCD temperature indicator with digital temperature control. And the makers have also included an interior light switch that you can turn on or off. Which allows you to light up your wine collection if desired. 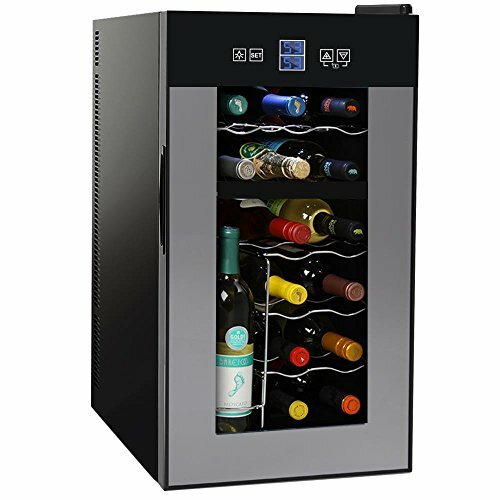 The Ivation 18-Bottle Wine Cooler is one of the best-selling wine fridges available online. The freestanding cooler holds up to 18 regular-sized wine bottles, making it a spacious choice for those wine enthusiasts that require a bit more capacity for their collection. The premium design by Ivation has a range of 54º to 64º Fahrenheit and features a special thermoelectric cooling function to keep your wine at constant, optimum storage temperature. Not only that, but this fridge is also insulated with heavy polyurethane foam to maintain constant humidity and prevent corks from drying out. The tempered, thermopane door of this fridge also aids in blocking out sunlight and UV-rays, preventing further spoilage of wine. The result is that the fridge keeps your wine fresher, longer – ensuring the long-term drinking quality of your favorite labels. 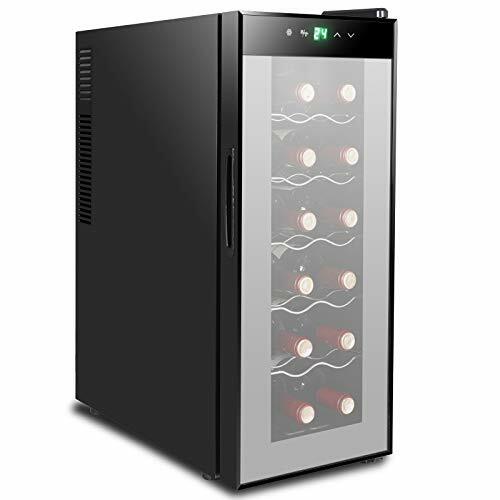 Another aspect we love about the Ivation 18-Bottle Wine Cooler is that it’s a very quiet choice. While some coolers can be a bit noisy, the Ivation wine fridge features a special energy-efficient cooling system without a compressor: which helps minimize vibration and noise, allowing you to enjoy your wines in tasty silence! Overall, you can’t really go wrong with this choice in Best Wine Cooler Refrigerators. It’s very spacious, very big on value-for-money appeal, and quiet-enough for storage in any room of your choice. Though the makers do recommend placing it inside your actual home, as placement in the garage might shorten its lifespan due to big fluctuations in room temperature. Just something to keep in mind when shopping for the best wine chiller for your needs! 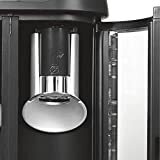 The NutriChef 18 Bottle Dual Zone Wine Cooler is a larger, advanced wine cooler for those looking to splurge a bit more. The premium wine cooler is a versatile choice that works as both a freestanding unit and as a built-in fridge. Put it at any location of your choice and enjoy its many benefits. The design by NutriChef has all the functions you need, plus some extra perks you didn’t know you wanted. This wine cooler has a special dual-zone system. And, therefore, maximizes your storage potential. Its dual-zone technology allows you to alternate temperature between the ‘upper’ and ‘lower’ zone. The upper zone has a range of 46-64° Fahrenheit. The lower zone has a range of 54-64° Fahrenheit. This feature allows you to store your white, sparkling and rosé varieties in just the right conditions for the specific wine type. Another perk of the NutriChef 18 Bottle Dual Zone Wine Cooler is its innovative vertical storage slots. These vertical shelves allow you to store opened bottles, without the risk of spilling. This Best Wine Cooler Refrigerators option features a premium LCD thermostat display. It also has a built-in circulation fan, and a reinforced glass door. The door is also designed to create an air-tight seal when closed. This reduces the risk of oxidation or spoiling of wines. This beauty also boasts high energy-efficiency, and that means low power consumption. You might have to invest a bit more right now to buy it, but you’ll definitely reap the energy-saving rewards in the long-term. The NutriChef Wine Cooler comes with a 1-year manufacturers warranty, which makes it a reliable, genuine choice in premium wine coolers. The Antartic Star 26 Bottle Wine Cooler is one of the most luxurious, high-end options on this Best Wine Cooler list. Yes, this wine fridge might be a quite pricey choice, but it’s also superior in functionality, spaciousness, and noise level. This premium wine cooler allows for maximum temperature control, with adjustable settings from 40°F to 61°F. The Antartic Star’s inside fan aids in circulating cold air to every corner of the fridge. A special, three-dimensional air-cooling cycle maintains a constant temperature for all stored bottle; keeping them in tip-top shape. 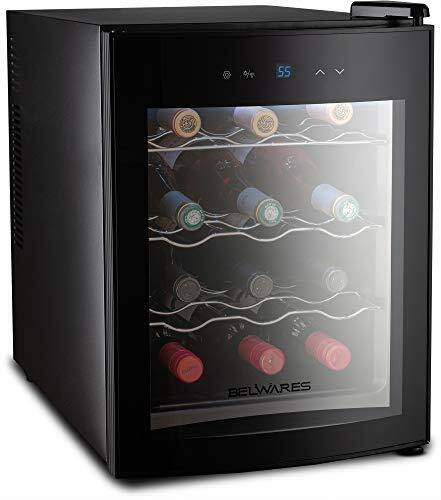 An optimum way to maintain the quality of your wines, this state-of-the-art fridge also comes with a special double-paned glass door to block out any harmful UV-rays that can degrade and age wine. The design by Antartic Star is very spacious and has a 26 standard bottle capacity. However, you can also choose to add in some canned beer or other beverages. Because this multi-functional design accommodates large quantities of any drink or your choice. The layout features horizontal racks and stainless-steel shelves for maximum space utility and durability. This superb design also is a top Best Wine Cooler Refrigerators pick for noise-control. The makers have ensured it has no vibration and is super quiet: meaning no annoying hum to distract you from your wine drinking fun. Intended as a freestanding wine fridge, do note that it is not suitable for built-in usage. 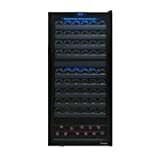 The 34-Bottle Vinotemp Wine Cooler with Touch Screen Controls is a high-end, luxury choice in wine coolers. This sleek fridge takes wine preservation to the next level, boasting impressive functionality. We particularly love the sleek touch screen control panel with LED lighting. Which makes the cooler easy to program, plus adds a futuristic touch – literally – to your chilling adventures. The spacious 34-Bottle Vinotemp Wine Cooler is built to last. It features superb durable aspects such as wire shelf racking and a premium quality dual-pane tinted glass door with a recessed handle. The temperature range of this Best Wine Cooler Refrigerators option is also more versatile than comparable designs by other brands. This Vinotemp product has an impressive range of 39°-65° Fahrenheit. The cooler offers plenty of space for most wine enthusiasts, storing up to 34 regular bottles on its 6 shelves. Another feature we like is the safety lock option. This function allows you to disable control panel access so that you – or perhaps your children – don’t accidentally adjust the temperature. Do note that the 34-Bottle Vinotemp Wine Cooler is designed as a freestanding unit only. It is not suited for built-in installation. Which, due to its larger size, might be something to consider if have limited free space. The super sleek 110-Bottle Dual-Zone Vinotemp Wine Cooler offers maximum space for all your wine storage needs. Who said you need a basement to have your very own wine cellar? This sleek fridge has all the capacity of classic wine cellars, but also all the contemporary, high-end perks. 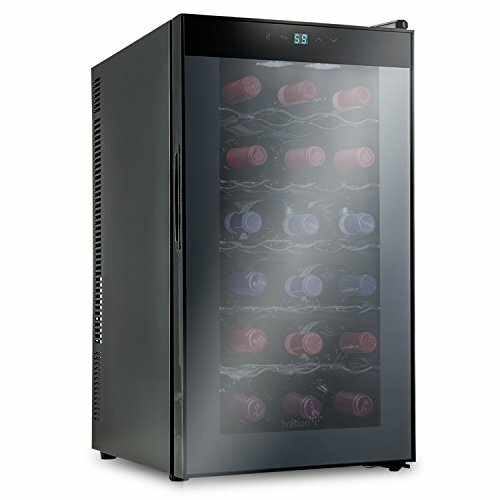 This top-end model in the Vinotemp assortment is the ultimate indulgence in wine coolers. The design features a special seamless, dual-paned glass door; sophisticated and ideal for maximum climate control. The large, versatile wine cooler does come with Vinotemp’s innovative dual-zone technology. Two separate zones allow you to store red and whites at separate, optimized temperatures. The top zone has room for 44 bottles, whilst the lower zones stores 66 wines. Both zones have an impressive temperature range of 40°-72° Fahrenheit. And that is the biggest margin of any Vinotemp wine cooler on this list. 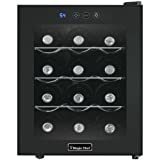 The 110-Bottle Dual-Zone Vinotemp Wine Cooler comes with many premium features, including gliding metal shelves with a black wooden lip for easy access to your bottles. 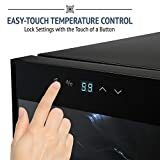 The device has intuitive digital controls on the exterior of the frame, meaning you don’t have to open the fridge to adjust the temperature. Another bonus is that the interior houses soft blue LED lighting, illuminating your bottles with an elegant glow. 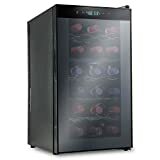 Big, bold, and quite beautiful: the 110-Bottle Dual-Zone Vinotemp Wine Cooler is a premium choice for wine enthusiasts who are serious about starting their own wine collection. Yes, we do realize this design might be too expensive for most amateur wine lovers, but we simply had to include it on this list as its too good to ignore. As die-hard wine enthusiasts, we’d recommend a quality wine cooler to everyone. Not only do these beauties keep your wines stored at optimum temperatures, extending the lifespan of your vino. They also offer great functionality to keep white wines at ideal serving temperature. Plus prevent oxidation of wines if they have a glass door to block out sunlight and harmful UV-rays. Your wines deserve some TLC: a wine cooler gives them exactly that. Why settle for a regular wine rack when you can take your wine enjoyment to the next level with a Best Wine Cooler? Exactly, you – and your bottles – deserve this indulgence! That said, we know a wine cooler can be a bit of an extravaganza. Which is exactly why our Best Wine Cooler list also includes some budget buys for under $100. This means you don’t have to break the bank to keep your chill. Which wine cooler is ‘the Best’ for you, really depends on your needs – and what you are willing to spend. Before you buy, consider what features you want, which capacity you need, and where you want to put the cooler. Now that you hopefully have a better understanding of all the options, finding your perfect match should be a lot easier!